Okay. Here’s how much they estimated was leaking before this evening: 42,000 gallons a day. Five times that amount means approximately 210,000 gallons a day have been leaking into the Gulf. If this spill continues unabated for two months — and that seems to be the most likely time frame at this point — we’re talking about 12.6 million gallons. Exxon Valdez? That was 10.8 million. But even that might be low. 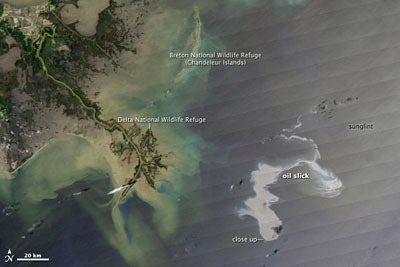 SkyTruth.org estimates that the spill rate is 20 times higher than initial estimates and that 6 million gallons of oil have already spilled into the Gulf. An Exxon Valdez size spill might only be a few days away.